!!! Two-person play by wireless is possible. !!! It is a simple baseball game of 2D like a baseball board. Please let me slide the pitched ball upwards and hit it with a finger. It can be made to slide on a ground also where. * A scoreboard and the button do not include it. When you are the bat well, a ball protrudes to the ground. You may miss a ball. If the vigor of a ball is strong and timing suits, this field will be exceeded and it will become a "home run." It will become a "single" if a ball stops on a ground. A fielder flies occasionally and catches a ball. A runner progresses according to the kind of hit. Moreover, the runner who has already got to the first base progresses similarly. The runner can advance (a steal, end run). When the fielder catches a ball, fielder throw a ball to the advancement. It is necessary to succeed in advancement earlier than a ball thrown a ball. **This game is different from a rule of the original baseball. 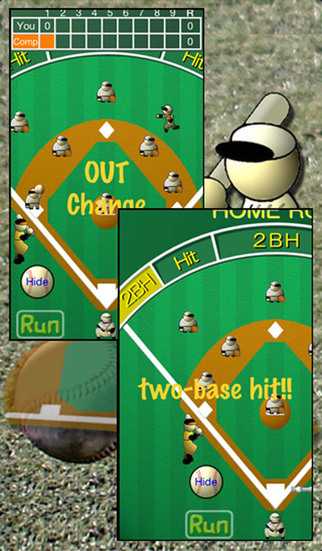 At the time of defense, you slide a finger toward the home base in "throw pad". 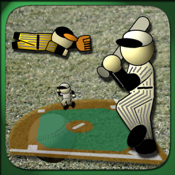 It becomes the breaking ball when you slide it to right and left while sliding it to the upper part. When you slide a finger fast, you throw a fast ball. * When I do not use a throw pad, I start a throw by a button. After a throw, it becomes hard to see a ball for an instant when I tap a button "to hide". * When chooses "The ball disappear". "The disappearing ball" can hit although a ball hides. 1)Both teams are only attack together. When you tap a throw button (ball button), a throw is started. The pitcher throws a straight and a curve ball. You play batting with a friend in turn or play the attack of both teams alone. 2)You play against a computer. The offense: batting and steel. You face it with two iPhone. You can choose the right batter and the left batter. You can change pitching Speed. You can change the "batting power". You can change the "Defense power". The Free version displays the advertisement on the screen. *It is different in an operation method of the "right or left batter choice","throw speed", but the function is the same.